As a four-time NFR barrel racing qualifier, Michele McLeod has plenty of valuable knowledge and experience to pass on to others. Thankfully for barrel racers, she’s been doing just that lately and I was grateful for the opportunity to catch up with her and multiple-time AQHA World Champion Calf Roper and Super Horse trainer, C.R. 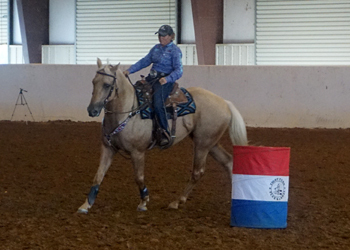 Bradley at a clinic they put on in Denton, Texas. It would be easy to assume that a competitor of Michele’s caliber has lofty secrets to success that may difficult for the average barrel racer to grasp and develop, but that’s not the case. Although her years of experience, genuine positivity and humble confidence translate to the horses she trains and rides in a way that’s unique to her, both through the example she sets, and now the quality instruction she offers, Michele confirms that big time success is really all about the simple things done with excellence, such as walking a perfect circle around a single barrel – which is something we all have the ability to do. In fact, doing so was the difference between her first NFR, where she claims to have never really perfected the first barrel – or even had the same first barrel turn more than once, compared to later years when she had much greater success. Of course, there’s a big difference between working the barrels and working them with excellence, or walking a circle and walking a perfect circle. So below I’ve shared a bit on what that looks and feels like for Michele and C.R. so you can perform them as well! Perfect circles can’t be stressed enough. Start by riding with two hands, with the goal of eventually using one. “We want their body arced just enough to see their inside eye, so they have bend through the ribs with the shoulder and body in alignment. Keep subtle leg contact, and when you release it should mean stop or back up. 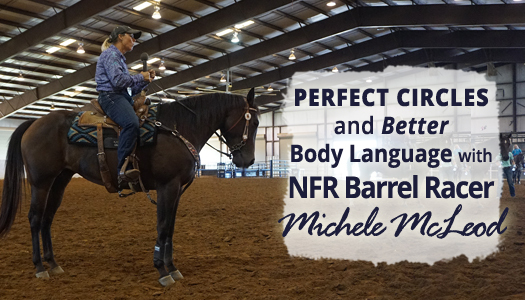 Especially for a horse that tends to run past the first barrel, Michele’s found it’s beneficial to keep reiterating small, relaxed, perfect circles, which brings balance to the horse mentally and gets them thinking more about turning vs. just running. Wide hands free up the shoulders. The hind end is slowing down and the front end is reaching. Michele shared that it’s normal for a horse to feel like they’re slowing down as they get aligned in a small circle around a barrel, because they’re taking fewer (but longer) steps. Speaking of steps, when it’s time to apply perfect circles to the actual pattern, she feels as though a straighter/longer approach is faster, where the turn takes place on the backside of the barrel. 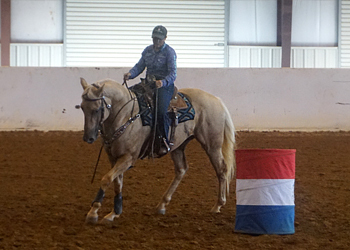 For a horse that tends to disengage at this point, correcting this habit can be achieved by transitioning into a larger (easier) circle, and using less inside rein. A horse that drops on their frond end will tend to feel rough and choppy, but Michele explained that we want the barrel turn to be a comfortable place where the horse stays collected and pushes off vs. getting strung out. Keep the hind end engaged as you finish the turn. A horse that is tense, emotional and tight through their back will tend to kick their hip to the outside due to a lack of flexibility through their body. Once this stiffness is resolved however, more suppleness, and therefore athleticism, becomes possible. On the other hand, some horses avoid the work of moving correctly and getting collected by rushing the turn, simply because they just haven’t been educated or conditioned well enough yet. For a ratey horse, she gathers them up even more, using repetitive transitions while especially emphasizing the upward transition. 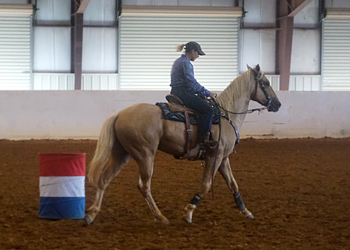 Michele suggests practicing gathered transitions enough that they become fluid, easy and second nature to the horse, by teaching them that they can transition and shift their weight easily while keeping forward motion, which makes the transition to speed work on the pattern a much easier one. It’s even easier, however when we’re doing our part to communicate well. Michele expertly and patiently coached students at the clinic through numerous drills including ‘Three Barrel Straights’ and ‘All Rights/All Lefts.’ Each student’s effectiveness for achieving the goal of a “perfect circle” throughout each exercise depended a lot on how they were using their own body. Rather than starting with rein pressure to ask a horse to move in and out of the circle, she recommend asking with the eyes first, for example, by looking down and to the inside to get the horse to move in, which also causes the horse’s body to become more round laterally. Our horse’s bodies follow our focus. We can even use our focus to assist with rate in the approach to the barrels. For a free running horse, keep your eyes focused down at a shorter distance and for a ratey horse, keep the eyes up and focused further forward (ex. two or more strides ahead). 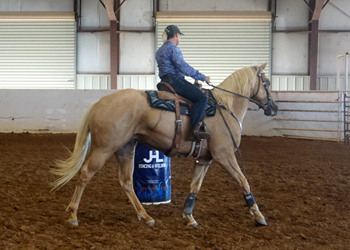 Using less inside rein enables our horses to stay more balanced and square in their bodies. As a result, a horse’s turns will be smoother and they’ll perform more comfortably the more we use our focus and body language. She reminded students to keep their elbows softly bent at their sides vs. straight and locked out in front. Using our eyes and body language to cue for the turn, while keeping our hands steady lessens the likelihood of bumping our horse’s mouth. We can even use our shoulders to communicate with our horses, after all – they’re connected to our arms/hands/reins, which connect to the horse’s sensitive mouth. Sounds like yet another step we can take toward faster, smoother runs! When it’s time to enter, Michele prefers a shorter rein to compete in, and feels most barrel racers are running in reins that are too long. She feels as though horses benefit from the subtle feel of the outside rein on their neck in a run, which helps keep them in the turn vs. floating out. She prefers not to slide her hand down the rein to turn, but keeps it in the same place as when riding to the barrel with two hands, then just drops one side and goes to the horn. This, she explained, avoids creating too much slack in the rein, and allows for a more consistent feel that also prevents a horse from dropping too low or getting bumped when the rein engages again, as well as lessens the likelihood of the rider getting behind or out of sync. So although “walking perfect circles” and the other points I’ve shared from Michele and C.R.’s clinic might not outwardly seem like well kept “secrets” to success for studious barrel racers, advanced horsemen know that it’s one thing to understand something mentally, and another entirely to really embody, apply and achieve it. So although it may sound simple, it’s not necessarily easy! 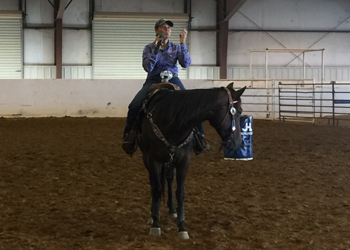 Thankfully, that’s where Michele McLeod’s expert eye and encouragement comes in – to gently reveal barrel racer’s blind spots and create positive, game-changing transformations, which have now been taking place across the country since Michele has been offering barrel racing clinics. 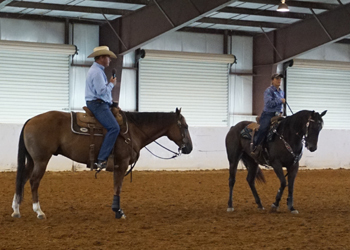 I strongly encourage you to jump at any opportunities you may have to saddle up with Michele McLeod or C.R. Bradley, so you can directly experience the benefits for yourself! Michele McLeod is a four-time NFR Barrel Racing Qualifier, an Old Fort Days Derby Champion and All American Congress Sweepstakes Champion. C.R. Bradley is an NFR Calf Roping Qualifier, a 16-time AQHA Open World Champion, and a two-time AQHA Superhorse Trainer. Michele would like to thank her sponsors, including Purina, Cinch, SmartPak, Oxy-gen, Shorty’s Caboy Hattery, Deuces Wild Tack, Professionals Choice, Response Products Cetyl M, and Flair Strips. To stay up to date with Michele, follow Team McLeod on Facebook. For Michele’s schedule or to host a clinic in your area, visit Michele McLeod Barrel Racing Clinics for more information. If you’re not already aware of just how incredibly inspiring Michele McLeod’s barrel racing journey is, enjoy the 30 minute documentary below sponsored by Purina. Out with the Goals, In with the New – What Do You Desire in the New Year? Five Keys to Consistency – Create Dependable Focus, Responsiveness and RESULTS! “I’m sure you hear this all the time but you have no idea how much your book has helped me and my horse already! I found myself doubting my ability but your book has helped me and my horse get back on track. Thank you so much!” – Linda H.
“This book is very beneficial for both the beginner, as well as the advanced rider. I enjoyed detailed explanation of the why, when, and how. Beautiful... ” - Cindy R.
“This book is so great. I love Heather and the way she works with horses... This book just demonstrates how to do drills and really all there is. I loooove... ” - Lesley J. 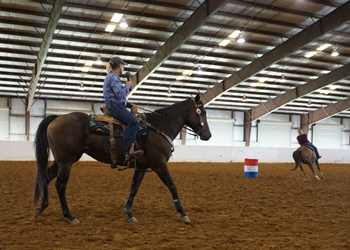 “This is just as good as The First 51 Barrel Racing Exercises! I have flags for references throughout the book. I recommend it to anyone who is serious...” - Vickie N.
“I just finished, and once again I would like to commend you on bringing many concepts to the table that aren’t in any of the other books on our sport. These are crucial to our success and will define our lives – both in and out of the arena. Thanks again.” – Sharyl N.
"My dream is like many of your readers, the NFR. It has been in my sight since I was a little girl and your book has helped me so much! My horses are working great now!” – Stephanie H.
"With everything that I learned from your book we performed the BEST run we have EVER, EVER, EVER had!! I had goosebumps from head to toe and was brimming with confidence!!!" - Ruby H.
"I just got your book today, and I have already tore through the first chapter. WOW!!! I am so glad I got this book, it is really an eye opener." - Andriea K.
"With everything that I have learned we performed the BEST run we have EVER, EVER, EVER had on Saturday!! I had goose bumps from head to toe and was brimming with confidence! I now have a horse running 1D times and have now performed the best run I have ever done on her." – Ruby H.
“I’m learning to be one with my horse in a run instead of just running him. He was barely getting by with no effort because he had no bond and no reason to want to please. Since I have implemented your suggestions he is already trying to please me, not just go through the motions.” – Autumn W.
"I had the BEST time this weekend with my horses. I actually came out of the arena after our run with a smile on my face and the first words out of my mouth were “that was fun,” and had compliments from several friends and a notable trainer in our area." – Kim M.
"He worked GREAT Friday night, I could feel the snap coming back in his turns… we were both so much more focused and he felt ready to work. We were 4/10ths faster… I was SO proud of him." - Kim M.
"My mare warmed up super and didn’t have any gate/alleyway issues. Thank you, Thank you, THANK YOU for your time, insight and help. So much to be grateful and blessed about in such a short time." - Kim M.
"There was no pulling, leaning on my hand or attempting to run past the barrel! She was so sooo responsive, thank you heaps for your help!" - Ruby H.
"Wow! What a difference. I had a plan going in that I was going to concentrate on getting my mare focused and keep her feet moving. She didn’t seem so nervous either… I didn’t have to check her going into the first, she also got herself in line for the second. I’m very happy. Thanks for all of your coaching. I will continue to use the strategies!" – Betsy N.
"I had a GREAT run tonight! All I did was stay off her head and use my body more to rate and turn as you suggested. I think that was my biggest problem and was why you noticed the hesitation she had before the turns. I really felt a difference in her turns as they felt more fluid and not so choppy. Thanks again for all the help!" – Evelyn P.
"It was great to visit with you for the video coaching… I started using the exercise you recommended for linking his hind end to his brain. We had an OUTSTANDING weekend and earned State Championships in both the Open 1D and the Masters (rider over 40), also in the 1D." – Michelle B. "It was our best weekend ever! We had been having problems with getting by the first barrel in the big outdoor pens, and we cranked it every run… just wanted to say a big thank you for your help!" - Michelle B. You approach has helped our performance! This is exactly what I needed!!! Thank you for sharing your incredible tips and expertise in such an approachable and passionate way. You approach has helped our performance! This is exactly what I needed!!! Thank you for sharing your incredible tips and expertise in such an approachable and passionate way. You approach has helped our performance! - Tara L.
They opened my eyes and helped me improve. I go to your website daily, have read your book and love your Facebook posts. They opened my eyes and have helped me improve. I go to your website daily, have read your book and love your Facebook posts. They opened my eyes and have helped me improve. - Jessica D.
I love reading your emails. You seem to hit home so much with me! Thank you! I love reading your emails. You seem to hit home so much with me! Thank you! - Sarah P.
Keep the emails coming...they not only are educational, but are like my devotionals that I read each day! Keep the emails coming...they not only are educational, but are like my devotionals that I read each day! - Scarlett M.
Your tips have made the world of difference. I found your website and started using your tips, drills and advice and they have made the world of difference. Love reading the articles! I found your website and started using your tips, drills and advice and they have made the world of difference. Love reading the articles! - Avery B.
I love your site and getting refreshers about what to do with certain problems that come up. So much stuff that's back there in my brain comes back with your site. I love your site and getting refreshers about what to do with certain problems that come up. So much stuff that's back there in my brain comes back with your site. - Avery B.
I just really wanted to let you know your articles mean the world to me, they guide me through my rough patches where I run out of knowledge! I just really wanted to let you know your articles mean the world to me, they guide me through my rough patches where I run out of knowledge! - Mackenzie M.
I just wanted to say a big thanks to you! It's crazy how much your info has helped me already and it has only been a couple of weeks reading your articles! I just wanted to say a big thanks to you! It's crazy how much your info has helped me already and it has only been a couple of weeks reading your articles! - Allannah B. You have no idea how much your book has helped me. I'm sure you hear this all the time but you have no idea how much your book has helped me and my horse already!! Thank you so much! I'm sure you hear this all the time but you have no idea how much your book has helped me and my horse already!! Thank you so much! - Lindi H.
Best thing I have invested in. I just recently bought a copy of your book Secrets to Barrel Racing Success and I absolutely love it. Best thing I have invested in. I just recently bought a copy of your book Secrets to Barrel Racing Success and I absolutely love it. Best thing I have invested in. - Ashlyn S.
I love your approach to training barrel horses and I so glad I stumbled upon your site. I appreciate all of the wisdom and experience you share! I love your approach to training barrel horses and I so glad I stumbled upon your site. I appreciate all of the wisdom and experience you share! - Christina W.
I can't wait to use your tips and know these things will carry over and give me the 1st barrel that will move him into a competitive 1D horse. "I am almost done with it, and I LOVE IT!!! I love the chapter on feel and awareness... your book was especially helpful. Someday, you will see me at the Nationals Finals, and you can sure bet who I will give credit to.” – Andriea K.
I light up every time I see a new email from you. I can't wait to put everything else a side, to hear about your discoveries and advice. I light up every time I see a new email from you. I can't wait to put everything else a side, to hear about your discoveries and advice. - Destanie M.
Those of us that realize 'the more you know, the more you know you don't know' love to continually learn, and don't consider knowledge a threat. Love your attitude. Those of us that realize 'the more you know, the more you know you don't know' love to continually learn, and don't consider knowledge a threat. Love your attitude. - Cindy R.
"Wanted to thank you... it has great information, and for anyone who thinks they don’t need 'another barrel racing book' on their shelf – this one is different!!" – Sharyl N.
Your advice and tips are very helpful along with your positive attitude it's very refreshing - I look forward to more! Your advice and tips are very helpful along with your positive attitude it's very refreshing - I look forward to more! - Kelsi O. "It has application way beyond the arena so I would highly recommend that you buy it and read it – and then read it again on a regular basis! !” – Sharyl N.
I'd like to tell you how much I enjoy your tips, videos, website, etc. and most of all your authenticity and transparency. It's refreshing and reaffirming. I'd like to tell you how much I enjoy your tips, videos, website, etc. and most of all your authenticity and transparency. It's refreshing and reaffirming. - Theresa W.
I love your tips and my mare and I just ran our best time at our county fair and missed the buckle by only two tenths of a second. Couldn't be more proud. I love your tips and my mare and I just ran our best time at our county fair and missed the buckle by only two tenths of a second. Couldn't be more proud. - Kristin T.
“I just bought your book, and I must say after reading it three times I just still can’t put it down! This book has given me more to be positive about and it has gotten me farther than ever!" – Stephanie H.
Your emails have helped me a TON! Your emails have helped me a TON!!! I always look forward to them... I can't wait for The First 51 Barrel Racing Exercises!!! Your emails have helped me a TON!!! I always look forward to them... I can't wait for The First 51 Barrel Racing Exercises!!! - Kelsi O. Thank you so much, Heather, for all that you do... I love reading every article and watching every video you post. You can't even imagine what an impact you have had on my life. Thank you so much, Heather, for all that you do... I love reading every article and watching every video you post. You can't even imagine what an impact you have had on my life. - Ashley H.
I can relate to each and every one of them. I find myself tearing up reading your messages because I can relate to each and every one of them. You and your faith is a breath of fresh air. I find myself tearing up reading your messages because I can relate to each and every one of them. You and your faith is a breath of fresh air. - Ashley H.
“I just recently bought a copy of your book and I absolutely love it. Best thing I have invested in.” – Ashlyn S.
"Just wanted to let you know that your Secrets book is awesome! 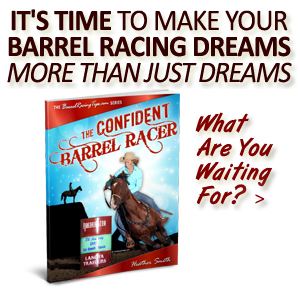 It totally covers what no other book does - the true secrets to barrel racing success!" - Jeana W.
"Thank you for all you have poured in to BarrelRacingTips.com. My dream is the NFR. Your book has reassured me that I am on the right path and to keep going." - Tina P.
I love the tips u share! Wow what an awesome message!!! I love the tips u share!!!! I've even started reading them to my husband! Thank you again. Wow what an awesome message!!! I love the tips u share!!!! I've even started reading them to my husband! Thank you again. - Dawn K.
"I have been relying on your book and look where it's got me, I now have a horse running 1D times and have now performed the best run I have ever done on her." - Ruby H.
I love getting my barrel racing tips! I love getting my barrel racing tips! There my jolt outta bed to saddle up and get going! I love getting my barrel racing tips! There my jolt outta bed to saddle up and get going! - Haley B.
I am almost done with your book, and I LOVE IT!!! Someday you will see me at the NFR, and you can sure bet who I will give credit to. I am almost done with your book, and I LOVE IT!!! Someday you will see me at the NFR, and you can sure bet who I will give credit to. - Andriea K.
"Just received the book. I cannot put it down - and I HATE to read! Job well done!" - Jennifer A.
I’m very happy with the results I have gotten. I have used your book so much and I'm very happy with the results I have gotten and the web site is great also. I have recommended it to all my friends. I have used your book so much and I'm very happy with the results I have gotten and the web site is great also. I have recommended it to all my friends. - Cindy W.
Thank you so much for all your inspiration it really does do wonders! Thank you so much for all your inspiration it really does do wonders! You really put things back in perspective when I need it. - Cherish H. when I need it. Thank you so much for all your inspiration it really does do wonders! Thank you so much for all your inspiration it really does do wonders! You really put things back in perspective when I need it. - Cherish H. when I need it. - Cherish H.
"Your book gives the real information that we are all looking for... those little secrets that the professionals do not tell." - Pat B. Thank you, I love waking in the morning and finding a BarrelRacingTips.com email in my inbox. Thank you, I love waking in the morning and finding a BarrelRacingTips.com email in my inbox. - Megan K.
It is really an eye opener. I just got your book today, and I have already tore through the first chapter. WOW!!! I am so glad that I got this book, it is really an eye opener. I just got your book today, and I have already tore through the first chapter. WOW!!! I am so glad that I got this book, it is really an eye opener. - Andriea K.
"I just bought your book, and after reading it three times I just still can't put it down! This book has gotten me farther than ever and helped me so much!" - Stephanie H.
Thank you from the bottom of my heart for all the advice you share in your books and emails. I am very thankful to have found your help. Thank you from the bottom of my heart for all the advice you share in your books and emails. I am very thankful to have found your help. - Stephanie W.
My daughter and I love your website! We have found several useful tips and something in every email that we can use. "I just recently bought a copy of your book and I absolutely love it. Best thing I have invested in." - Ashlyn S.
Smooth and fast… it REALLY helped. I was having trouble on my 2nd barrel... I went out to run after reading through some tips and did great - smooth and fast... it REALLY helped. I am so happy we finally got the 2nd barrel down! I was having trouble on my 2nd barrel... I went out to run after reading through some tips and did great - smooth and fast... it REALLY helped. I am so happy we finally got the 2nd barrel down! - Rachel B. "I have used your books so much and I'm very happy with the results I have gotten... I have recommended them to all my friends." - Cindy W.
"Thank you from the bottom of my heart for all the advice you share in your books... I am very thankful to have found your help." - Stephanie W.
"We purchased your books, and since using the exercises she shaved a massive two seconds off, thank you! We are always looking for ways to support our daughter to achieve her goal." - Fiona H.
“With everything I learned, we performed the BEST run we have EVER, EVER, EVER had!! I had goose bumps from head to toe and was brimming with confidence!” – Ruby H.
I just wanted to say THANK YOU. I just found your web site it's already been an inspiration and a very pleasant surprise! I just wanted to say THANK YOU. I just found your web site it's already been an inspiration and a very pleasant surprise! - Tracy M.
Thank you for this site. It makes me stay on top of what I'm working on with my horse. It keeps me thinking, improving and re-evaluating myself. Thank you for this site. It makes me stay on top of what I'm working on with my horse. It keeps me thinking, improving and re-evaluating myself. - Kassandra M.
I'm really taking in your articles. I've found your website to be the most helpful barrel racing tool I've ever found! I'm really taking in your articles. I've found your website to be the most helpful barrel racing tool I've ever found! - Ruby H.
We purchased your books and since using the exercises shaved a massive 2 seconds off... thank you... we are always looking for ways to support our daughter to achieve her goal of making it to the states. We purchased your books and since using the exercises shaved a massive 2 seconds off... thank you... we are always looking for ways to support our daughter to achieve her goal of making it to the states. - Fiona H.
My goal is to keep increasing speed, stamina and a willing, active participation with my horses. By following you and learning from your tips and tutorials, I have! My goal is to keep increasing speed, stamina and a willing, active participation with my horses. By following you and learning from your tips and tutorials, I have! - Jessica W.
We ran great runs, I was so happy. We ran great runs, I was so happy. Thank you so much for all the help... I have excelled so much with the tips you have given me. I will forever look up to you when I need help! We ran great runs, I was so happy. Thank you so much for all the help... I have excelled so much with the tips you have given me. I will forever look up to you when I need help! - Rachel B.
You’ve inspired me to go after my dream. I'd like to start off by saying I LOVE your website and both of your books. You've inspired me to finally go after my lifelong dream. I'd like to start off by saying I LOVE your website and both of your books. You've inspired me to finally go after my lifelong dream. - Stacy T.
…they have helped me so much. I really enjoy all your tips, they have helped me so much. Thanks for all your help so far to be successful in my barrel racing career! I really enjoy all your tips, they have helped me so much. Thanks for all your help so far to be successful in my barrel racing career! - Brittaney B. … it has brought me and my horse to new heights. Today I tried some of the exercises.... It helped so much and has brought me and my horse to new heights. Thank you for sharing your expertise with everyone! Today I tried some of the exercises.... It helped so much and has brought me and my horse to new heights. Thank you for sharing your expertise with everyone! - Skylar S.
Just from reading your tips I’ve won my biggest check ever! Just from reading your tips I've won a quad, a bench, and my biggest check ever! I ran a whole second faster than I ran here last year! Just from reading your tips I've won a quad, a bench, and my biggest check ever! I ran a whole second faster than I ran here last year! - Cheryl K.
I absolutely love this site, great amount of knowledge that I'm not aware of. Love learning new ways to work with my horses. Thank you! I absolutely love this site, great amount of knowledge that I'm not aware of. Love learning new ways to work with my horses. Thank you! - Bridget K.
It's great that you take time out of your busy schedule to write and help your readers reach their goals. Thanks for doing what you do and keep up the great work! It's great that you take time out of your busy schedule to write and help your readers reach their goals. Thanks for doing what you do and keep up the great work! - Hailey B. Thanks Heather for all your tips! I've been applying them when teaching my lessons, the difference in my horses and riders is tremendous! I love all the exercises! Thanks Heather for all your tips! I've been applying them when teaching my lessons, the difference in my horses and riders is tremendous! I love all the exercises! - Anne-Marie M.
…it answers any questions we have. My friend and I barrel race together and every time we ride we talk about something you sent us in an email and it answers any questions we have. My friend and I barrel race together and every time we ride we talk about something you sent us in an email and it answers any questions we have. - Paige H.
Thank you so much for all of the valuable information you provide. I have learned so much from this site in the last year, which would normally have taken me years and years to learn! Thank you so much for all of the valuable information you provide. I have learned so much from this site in the last year, which would normally have taken me years and years to learn! - Sarah E.
We earned State Championships in the Open 1D! We had an OUTSTANDING weekend and earned State Championships in both the Open 1D and the Masters (rider over 40). It was our best weekend ever! We had an OUTSTANDING weekend and earned State Championships in both the Open 1D and the Masters (rider over 40). It was our best weekend ever! - Michelle B.
I just want to acknowledge how much I love your page. I recently purchased your book too. I am thankful for all your tips and always look forward to more. I just want to acknowledge how much I love your page. I recently purchased your book too. I am thankful for all your tips and always look forward to more. - Alice J.
I absolutely LOVED your book. I am so thankful for your insights... I feel like I am on the same journey and by reading your book I have been fast-forwarded. I absolutely LOVED your book. I am so thankful for your insights... I feel like I am on the same journey and by reading your book I have been fast-forwarded. - Stephanie W.
A lot of this goes unknown. A lot of this information goes unknown for many horse owners - those who have just been doing as it's been done 'BECAUSE it's always been that way.' - Jodi L.
I liked that the book talked about the unspoken things of horses... It really stimulated my thought process to think what's better for my horse than what's convenient for me. I had no idea... - Autumn W.
Just wanted to let you know that your Secrets book is awesome! 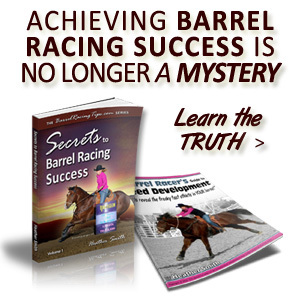 It totally covers what no other book does - the true secrets to barrel racing success! Just wanted to let you know that your Secrets book is awesome! 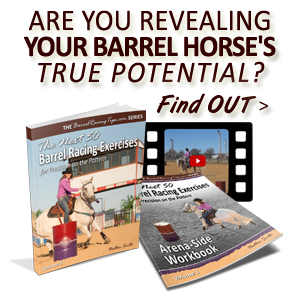 It totally covers what no other book does - the true secrets to barrel racing success! 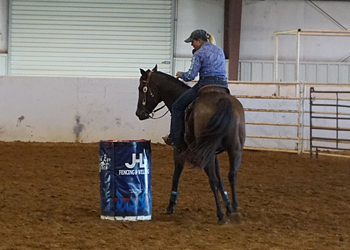 - Jeana W.
Received my Secrets to Barrel Racing Success. It has great information and for anyone who thinks they don't need 'another barrel racing book on their shelf' - this one is different!! Received my Secrets to Barrel Racing Success. It has great information and for anyone who thinks they don't need 'another barrel racing book on their shelf' - this one is different!! - Sharyl N.
Every time you send me something, you always hit home. Thank you, so much. Every time you send me something, you always hit home. Thank you, so much. - Michele H.
I have been having a rough time lately and you put a lot of things into perspective for me. Thank you so much... it really helped. Keep the emails coming I really enjoy the tips! I have been having a rough time lately and you put a lot of things into perspective for me. Thank you so much... it really helped. Keep the emails coming I really enjoy the tips! - Ronda G.
I get so excited every Tuesday, I wake up and the first thing I do (besides feed my horses of course) is read your email! I get so excited every Tuesday, I wake up and the first thing I do (besides feed my horses of course) is read your email! - Connie J.
I was just gonna let you know I absolutely love your emails! Thank you so much and keep 'em coming!!! P.S. I loved your book so much! I was just gonna let you know I absolutely love your emails! Thank you so much and keep 'em coming!!! P.S. I loved your book so much! - Lauren T.
Thank you for asking the question: 'What am I doing daily to reach my goals?' My heart aches to be back on top again, and I won't stop trying! Thank you for asking the question: 'What am I doing daily to reach my goals?' My heart aches to be back on top again, and I won't stop trying! - Stephanie W.
…we cranked it every run… big THANK YOU! We had been having problems with getting by the first barrel in the big outdoor pens, and we cranked it every run… just wanted to say a big THANK YOU for your help! We had been having problems with getting by the first barrel in the big outdoor pens, and we cranked it every run… just wanted to say a big THANK YOU for your help! - Michelle B. The amount of information surprised me, the book revealed holes in my foundation. Thank you for all the information you have provided the barrel racers. The amount of information surprised me, the book revealed holes in my foundation. Thank you for all the information you have provided the barrel racers. - Sarah L.
Thank you so so much, I cannot tell you how much your articles and emails have helped me. :) - Anna W.
The book has made me stop and think more before I ride and not just go through the motions. Two thumbs up!! Appreciate your tips as always and the timing amazes me... they always give me confidence I am on track or include that one little piece of valuable information that makes a huge difference! Two thumbs up!! Appreciate your tips as always and the timing amazes me... they always give me confidence I am on track or include that one little piece of valuable information that makes a huge difference! 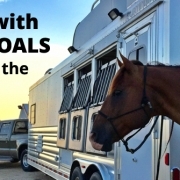 - Sandy H.
“Finally, finally there is a top-notch guide for BOTH horse & rider! This book is well laid out and easy to use. HIGHLY recommend to any barrel racer wanting to up their game and get the best from yourself and your horse.” – Marsha H.
I just want to say again how exceptional the information you are sharing is! Your book is extremely profound and totally inspiring & exciting! Thank You!!! I just want to say again how exceptional the information you are sharing is! Your book is extremely profound and totally inspiring & exciting! Thank You!!! - Shawnee S.
Thanks for keeping me focused on my dreams. I love these articles you send... they are always so timely when I’m challenged by what you write about and cover!! Thanks for helping me keep on track and focused on what my dreams are. I love these articles you send... they are always so timely when I’m challenged by what you write about and cover!! Thanks for helping me keep on track and focused on what my dreams are. - Tammy P.
It put a spark back in me. I've really enjoyed the book more than you could imagine. It's put a spark back in me that I haven't had in the past 10 years. I've really enjoyed the book more than you could imagine. It's put a spark back in me that I haven't had in the past 10 years. - Hillary R.
I found your site a few months back and have been obsessed! It has helped me and my horse tremendously, especially with the first barrel. I found your site a few months back and have been obsessed! It has helped me and my horse tremendously, especially with the first barrel. - Amelia B. “Just wanted to let you know that your book is awesome! It totally covers what no other book does. 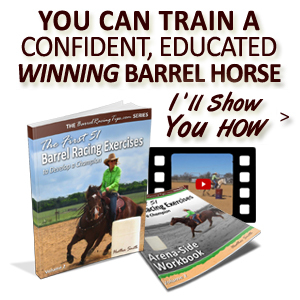 What I’ve read covers the true secrets to barrel racing success – that are not obvious!” – Jeana W.
Thank you for all you have poured in to BarrelRacingTips.com. My dream is the NFR. Your book has reassured me that I am on the right path and to keep going no matter how hard it gets. Thank you for all you have poured in to BarrelRacingTips.com. My dream is the NFR. Your book has reassured me that I am on the right path and to keep going no matter how hard it gets. - Tina P.
With everything that I learned from your book we performed the BEST run we have EVER, EVER, EVER had!! I had goosebumps from head to toe and was brimming with confidence!!! With everything that I learned from your book we performed the BEST run we have EVER, EVER, EVER had!! I had goosebumps from head to toe and was brimming with confidence!!! - Ruby H.
I have been relying on your book and articles and look where it's got me, I now have a horse running 1D times and have now performed the best run I have ever done on her. I have been relying on your book and articles and look where it's got me, I now have a horse running 1D times and have now performed the best run I have ever done on her. - Ruby H.
There was no pulling, leaning on my hand or attempting to run past the barrel! She was so sooo responsive, thank you heaps for your help! There was no pulling, leaning on my hand or attempting to run past the barrel! She was so sooo responsive, thank you heaps for your help! - Ruby H.
"I have been relying on your book and look where it’s got me, I now have a horse running 1D times and have performed the best run I have ever done on her. She was so sooo responsive, thank you heaps for your help!” – Ruby H.
I love what I’m learning! I just want to say that what you are doing is AMAZING!! I absolutely love what I'm learning & it's already changing things so much for the better for myself & my horses! I just want to say that what you are doing is AMAZING!! I absolutely love what I'm learning & it's already changing things so much for the better for myself & my horses! - Shawn S.
THANK You... just reading and paying attention and watching... it's changed the way I look at horses... it's changed what I've done in our program for the better. THANK You... just reading and paying attention and watching... it's changed the way I look at horses... it's changed what I've done in our program for the better. - Reba S.
“I absolutely LOVED your book. I am so thankful for your insights... by reading your book I have been fast-forwarded. Thank you for your inspiration!” – Stephanie W.
Your articles helped me persevere. I appreciate your web site and videos. I had started to lose the love I had for riding and your articles helped me persevere. I have been so thankful to find your site through all my soul searching. I appreciate your web site and videos. I had started to lose the love I had for riding and your articles helped me persevere. I have been so thankful to find your site through all my soul searching. - Tracey J. He is coming along BEAUTIFULLY! This is awesome! I have been barrel racing for quite a while now and finally am starting my own horse. With your tips he is coming along BEAUTIFULLY! This is awesome! I have been barrel racing for quite a while now and finally am starting my own horse. With your tips he is coming along BEAUTIFULLY! - Robin F.
“I would like to commend you on bringing many concepts to the table that aren’t in any of the other books on our sport. It’s perfect for anyone who doesn’t think they need “another barrel racing book! !” – Sharyl N.
Your website and book gives the real information that we are all looking for... those little secrets that the professionals do not tell. Your website and book gives the real information that we are all looking for... those little secrets that the professionals do not tell. - Pat B. Everything is eye-opening and awesome! I have recently discovered your website and immediately became addicted to it! There is so much to learn and everything is eye-opening and awesome. I have recently discovered your website and immediately became addicted to it! There is so much to learn and everything is eye-opening and awesome. - Karen T.
I just want to thank you for your articles. I have related very personally from all of them and was able to execute a very nice run this past weekend. I just want to thank you for your articles. I have related very personally from all of them and was able to execute a very nice run this past weekend. 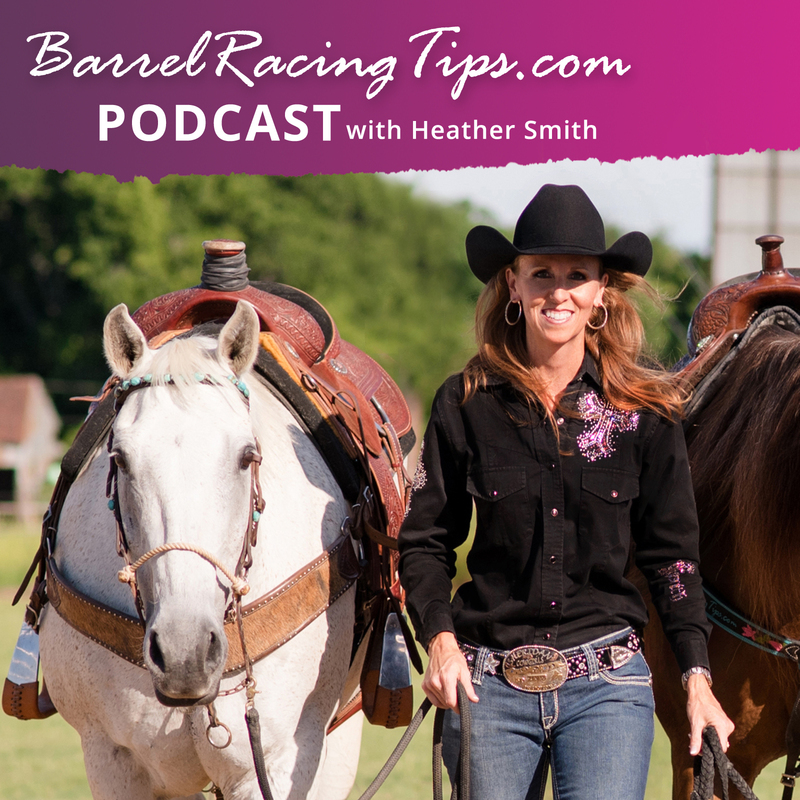 - Sandy H.
I look at every email that comes through from barrel racing tips, I read all of them and there's not one thing that I find that I have not learned something from. “I’ve been having trouble with my mare at increased speed... Your book has helped me and my mare so much, our turns are even more ‘snappy!’ Thank you for offering your time to all of us who dream of making that perfect run! !” – Lisa P.
This book helped me so much! I just bought Secrets to Barrel Racing Success, and after reading it three times I just still can't put it down! This book has gotten me farther than ever and helped me so much! I just bought Secrets to Barrel Racing Success, and after reading it three times I just still can't put it down! This book has gotten me farther than ever and helped me so much! - Stephanie H.
You have helped more than you know! My ideal outcome is to get into the NFR. You will defiantly be one of the many people I thank once I get up there, you have helped me more than you know. My ideal outcome is to get into the NFR. You will defiantly be one of the many people I thank once I get up there, you have helped me more than you know. - Stephanie H.
“Your book gives the real information that we are all looking for. It is easy to understand and it is those little secrets that the professionals do not tell. You are really helping horses with people problems more than you can imagine.” – Pat B. Your information has been extremely helpful. I check out your site regularly and have printed many articles to add to my barrel bible. Your information has been extremely helpful, clear and easy to understand. I check out your site regularly and have printed many articles to add to my barrel bible. Your information has been extremely helpful, clear and easy to understand. - Kim O. It has made a large impact on our training. Thank you again for the things you do on your site and the e-mails, it has made a large impact on our training. I greatly appreciate it all! Thank you again for the things you do on your site and the e-mails, it has made a large impact on our training. I greatly appreciate it all! 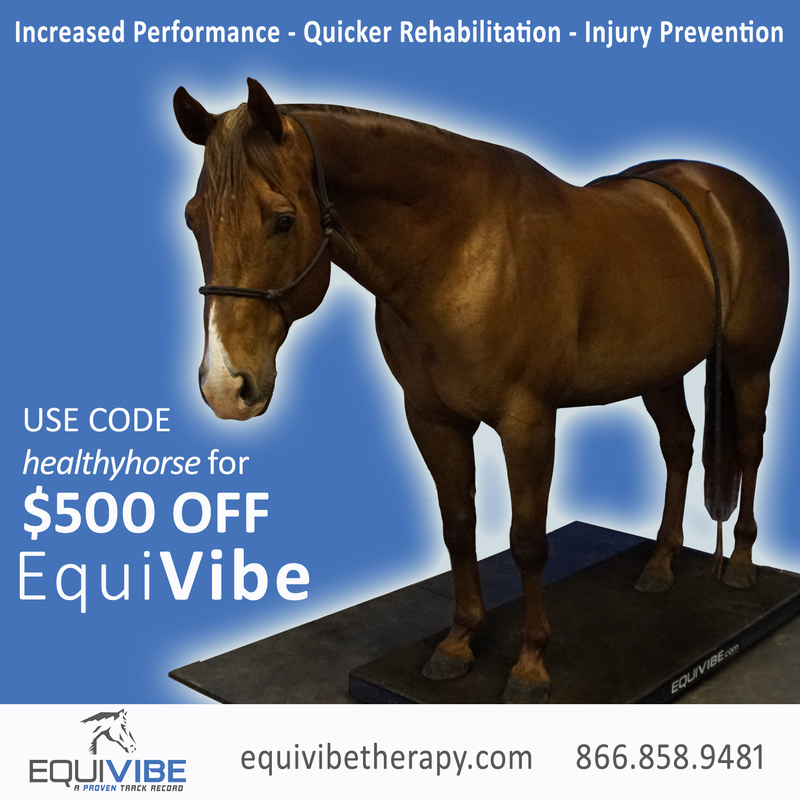 - Gretchen K.
“…these exercises have helped my horse become more responsive and flexible. I also appreciate the exercises for the rider... Thanks for being so thorough and breaking it all down! Love the patterns and pictures.” – Susan D.
Thank you for all your helpful tips! Thank you for writing that wonderful book and for all your helpful tips. I have learned so much from them and will continue to use them as resources! Thank you for writing that wonderful book and for all your helpful tips. I have learned so much from them and will continue to use them as resources! - Amy S.
I really enjoy reading your emails and am finding your thoughts, tips and comments very motivating and unlike anything I have ever come across in the barrel racing world! I really enjoy reading your emails and am finding your thoughts, tips and comments very motivating and unlike anything I have ever come across in the barrel racing world! Sandy K.
“I wanted to let you know what a profound effect your book had on me. I was brought to tears... I struggle with confidence every day and just having this resource available means a lot.” – Audrey R.
It has helped me win races! Thank you SO much for creating BarrelRacingTips.com. It is my go-to website and has helped me win races! Thank you SO much for creating BarrelRacingTips.com. It is my go-to website and has helped me win races! - Ellie J. It worked like a charm! He was especially having problems with his first barrel (not rating), so I came to your website, found an article, and it worked like a charm! Thanks again, Heather. He was especially having problems with his first barrel (not rating), so I came to your website, found an article, and it worked like a charm! Thanks again, Heather. - Ellie J. “…very motivating and unlike anything I have ever come across! ...such a breath of fresh air! I am definitely not the same person, I have much more wisdom and appreciation now.” – Shilah H.
“Heather, I just want to thank you from the bottom of my heart for putting this material together. It inspires me to keep going. I am so grateful you were willing to compile this information. Thank you again.” – Anna E.